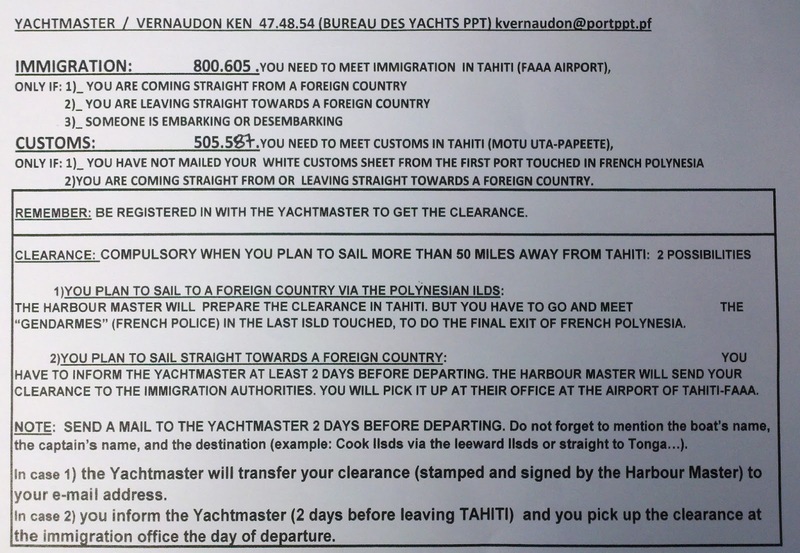 French Polynesia yacht clearance procedure as of May 2013. This is for those of you didn't use a yacht agent. 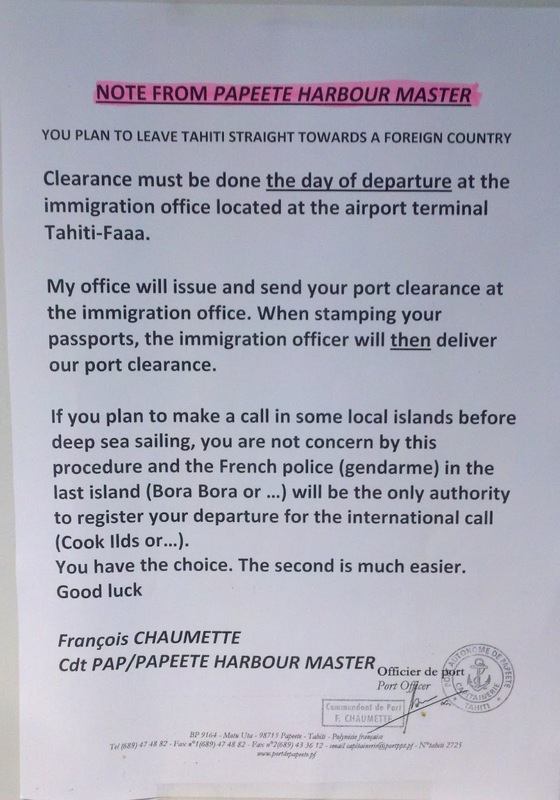 For clearance from French Polynesia you have two options. Since it's our third time to FP and our visa was almost expired we chose option (2) shown in the 'Clearance' document below as we needed to leave quickly. 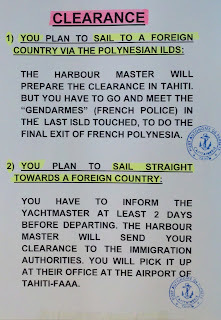 IF you have more time on your visa then be sure to complete Steps 1 and 2 while in Papeete then sail up island and complete the final steps with the Gendarmes in Bora Bora and obtain your final clearance there. 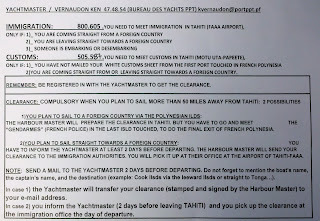 Here's what we did to clear directly from Papeete, Tahiti to a foreign port. Step 1: Try to find the Harbor Master office before they close for lunch. Hint: Downtown Papeete at the 'Moorea' ferry terminal bottom level on water side of building (see map below). Hint: It's near the container port across the water from the ferry/harbor masters office on Motu Uta. The Customs (Douane)office is about 1500pf taxi ride or if your a crack sleuth only a 25 minute walk from the harbor master. Go in the main door at Douane and walk down the hall ~1/2 way finding the office on the right. Note: We completed steps 1 & 2 the day before our departure and step 3 on the day of departure. The guidance below says you need 2 days advance notice, but that was not necessary in our case. Step 3: Go to Immigration at the airport the day of departure. Location: Faaa airport. Find the food court near the middle of the airport, take the stairs on the right side of the food court half way up find a mid-stair on the right. Throught he door into the roof court yard find the immigration office on the right. Step 4: Collect you bond at the bank. 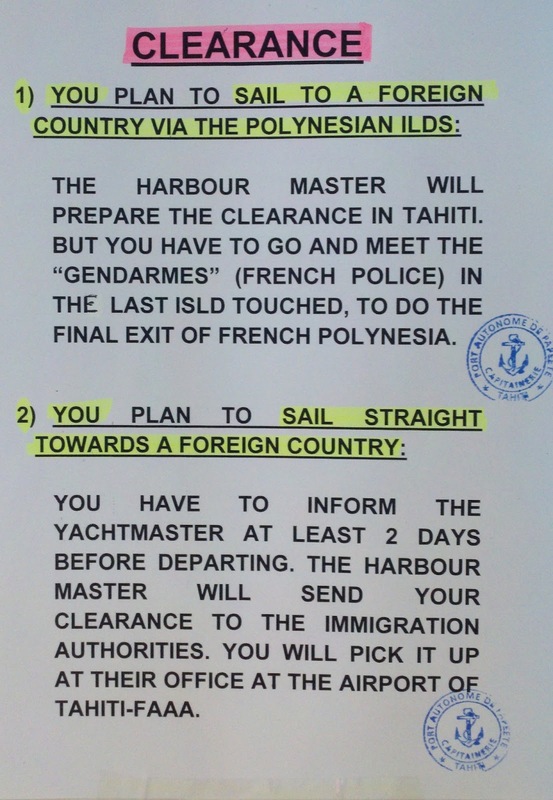 Step 5: Be a good visitor and leave French Polynesia in a timely manner. Be aware that customs patrol boats routinely check papers even in the remotest of anchorages. Click on this photo for a larger more legible view. Sorry the map is terrible, but this is what's available at Harbor masters office... if you can find it. LightSpeed setting sail for points west.